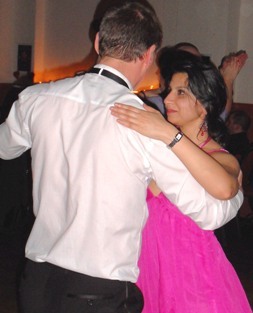 Salsa Tecnica is run by experienced salsa dance teachers Dave and Ruby Mitchell. We hold friendly and fun classes on Friday nights at the Fellside Centre in Kendal, in the South Lakes area of Cumbria. Our beginners and improvers class runs from 7:30 to 8:15. This class is ideal for dancers who want to learn the basics of salsa and to lead and follow simple turn patterns. From 8:30 to 9:15 we learn and practice rueda de casino (or just rueda), which is a form of salsa danced in a circle, with a caller (or cantante) where you change partners regularly. Rueda is great fun in itself but is also an excellent way of learning and practising new and interesting techniques and moves. You can find a list of the rueda moves we currently use here. Classes are run on a drop-in basis. You do not need to book. Just turn up. You do not need to bring a partner, although it would be wonderful if you could. The cost is £5 for either or both classes. Interested? Always thought you'd like to dance salsa? Then dig out your dancing shoes and come along.